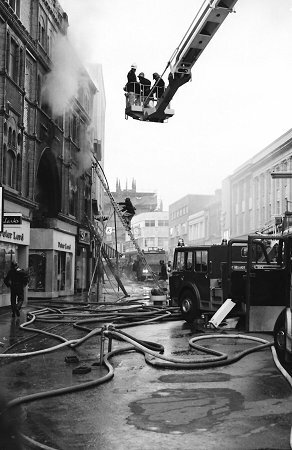 In 1974 a disastrous fire destroyed Wolverhampton's last surviving Victorian shopping arcade, the Central Arcade. 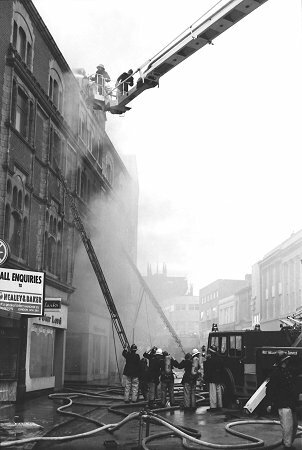 Many people will fondly remember the arcade which ran between Dudley Street and St. John's Street. 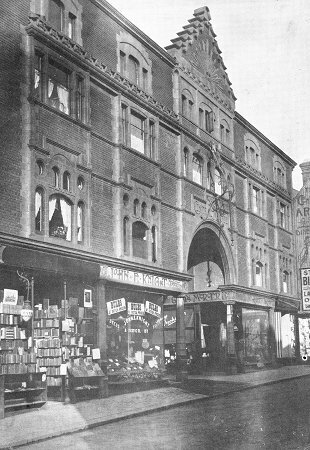 It was a lovely structure, a pleasant place to shop, with an ornate cast iron and glass roof, and beautiful shop fronts displaying a wide range of goods in the large shop windows. An early view of the arcade. 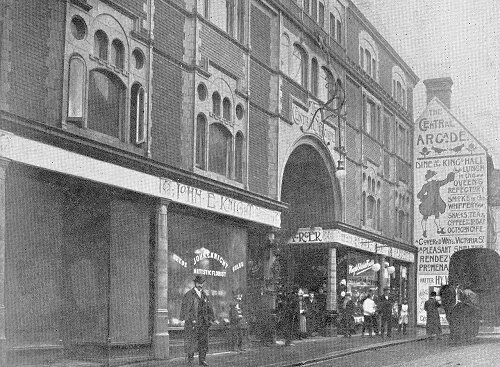 The arcade in 1903. The Central Arcade was built by E. J. Charles of Birmingham and opened in 1902. 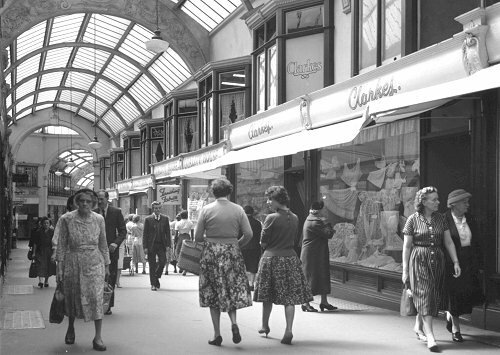 As well as a wide variety of shops, it contained the King's Hall Restaurant, a working men's club, and on Saturdays bands would play music from a half-circle balcony at the centre of the arcade. 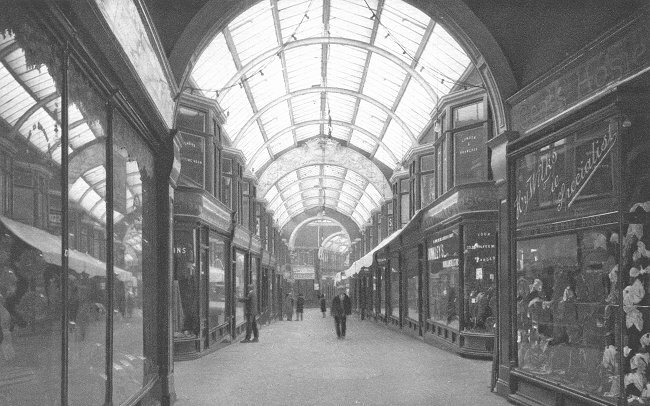 Above the lower end of the arcade was a little workshop run by Jack Rushton, who owned Radio, Motors and Cycles Limited in Victoria Street. He employed two girls in the workshop, who built the radio sets that were sold in his shop. Miller and Sherwood Limited, toy and pram shop. W. S. Miller Limited, china and glass shop. 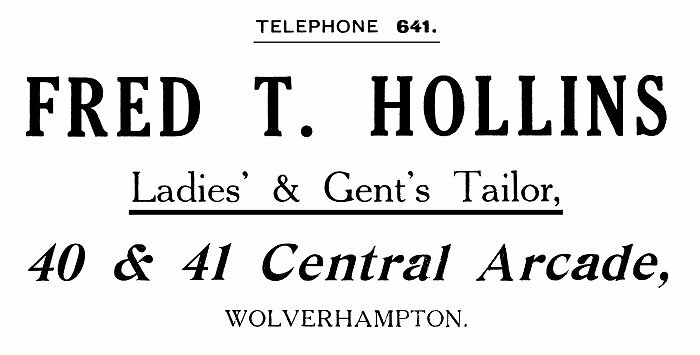 H. J. Pountney & Sons, outfitters. L. N. Vardy, tobacconist and confectioner. F. Wright & Son (Carpets) Limited. 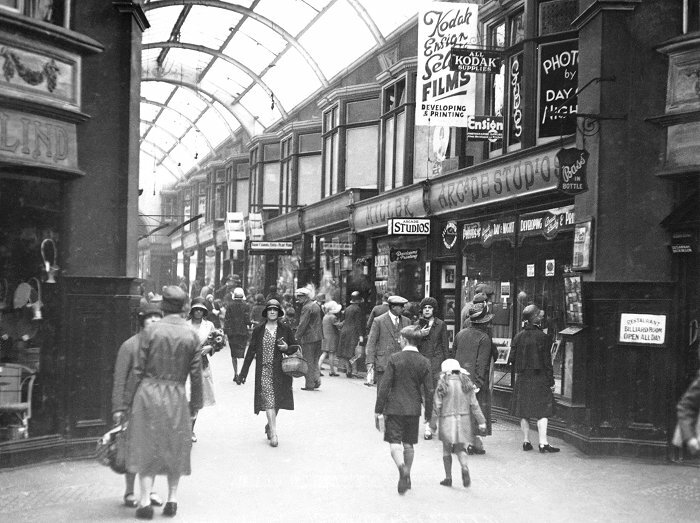 The arcade in about 1910. 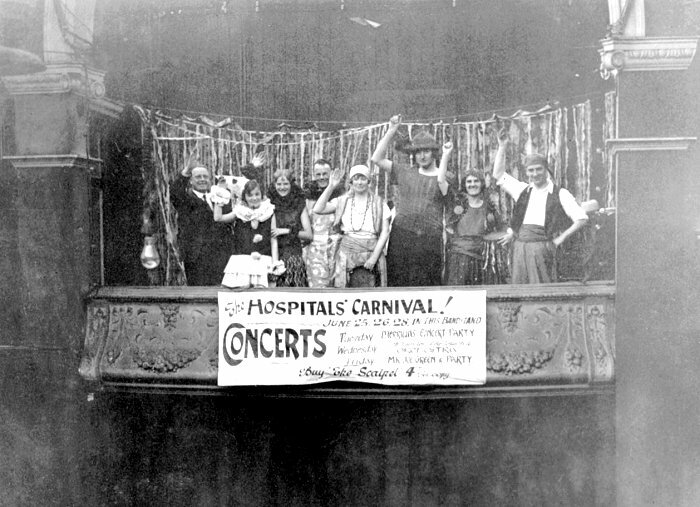 A lovely photograph of a concert party on the balcony in the arcade, possibly in June 1929, when the days and dates tie-up. They were fundraising for local hospitals. Courtesy of David Clare. A closer view of the concert party. Courtesy of David Clare. 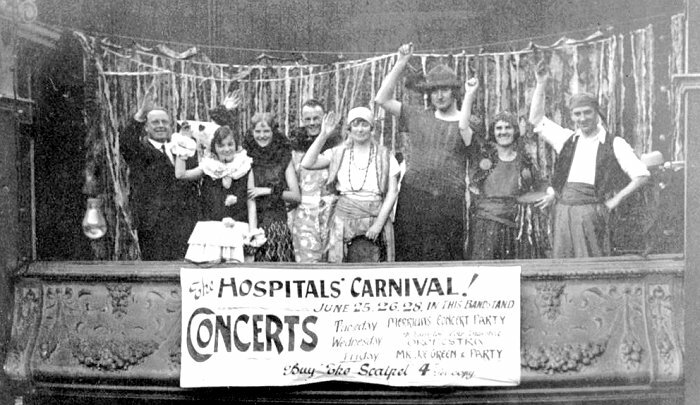 The concert party's banner. Courtesy of David Clare. 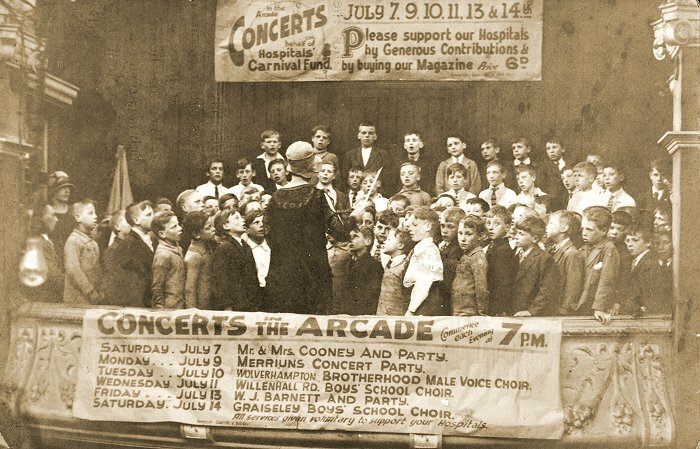 A school choir in action on the balcony, either from Graiseley Boys' School or Willenhall Road Boys' School. Probably from 1928 when the days and dates tie-up. Thanks to David Clare. An interesting view of the arcade on a busy shopping day. Courtesy of David Clare. 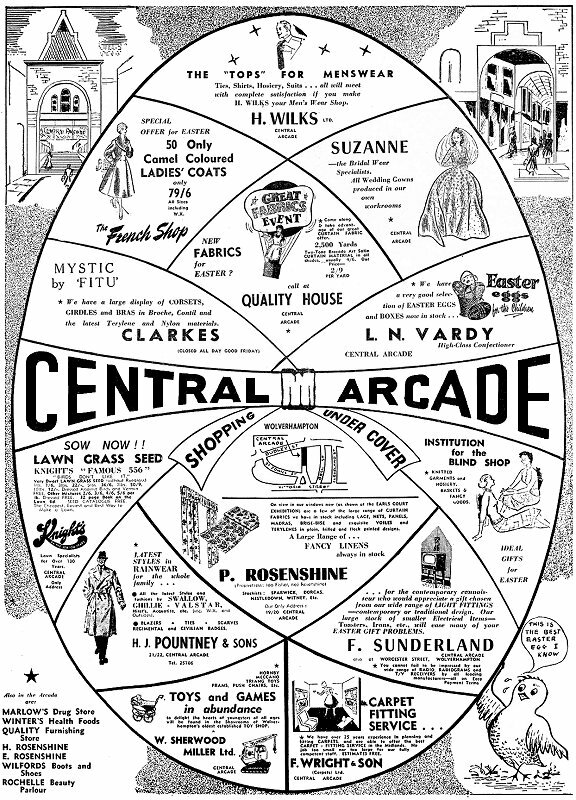 An advert from 1927 for Arcade Studios, which can be seen in the photograph above. An advert from November 1956. Courtesy of David Clare. An advert from March 1958. Courtesy of David Clare. F. Sunderland, lighting, radio and television. 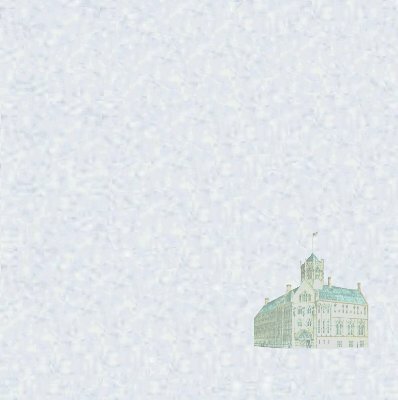 Institution for the blind, basket makers. On the left an advert from 1903, on the right an advert from 1938. Some of the traders worked in the arcade for many years, and their shops became well known. One such shop was run by Frank Wright, a carpet dealer. 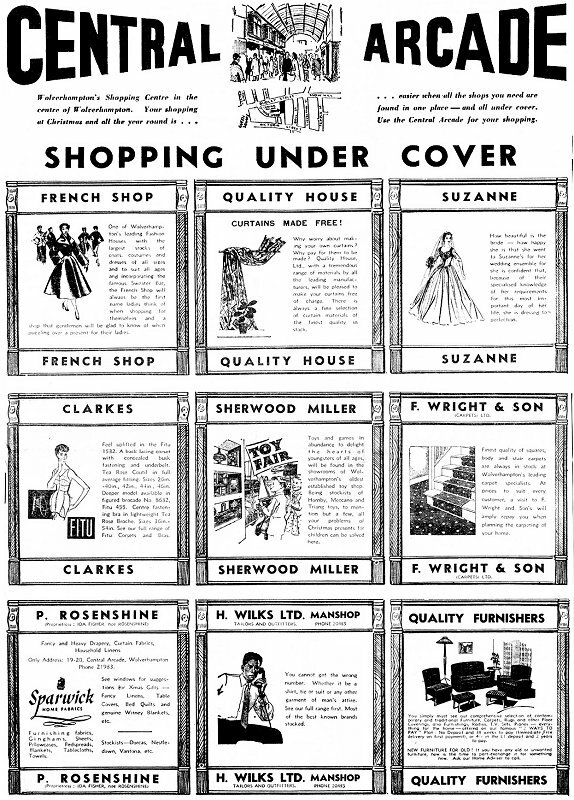 In 1932 it became F. Wright & Son (Carpets) Limited when Jack Wright joined his father in the business. 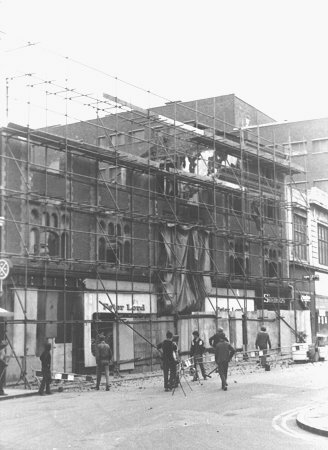 In the late 1960s the shop moved to Pipers Row, where it remained until 1982 when it was sold. The family had another claim to fame in the form of Jack Wright's son, David John Wright who became a well respected, and well known Civil Servant. Jack Wright was born in Kidderminster where he became a carpet trade apprentice, before joining his father's business. After his move to Wolverhampton, Jack, his wife Phyllis, and children David and Kathleen lived in St Philip's Avenue, and later Holly Grove. David went to Woodfield Avenue Primary School followed by Wolverhampton Grammar School. During his school holidays he helped-out in the shop, selling, delivering, and fitting carpets, as well as going to Molineux to watch Wolves play. On leaving school he secured a place at Peterhouse, University of Cambridge, from where he graduated in history in 1966. He joined the Foreign Office in 1966 and became Third Secretary, later Second Secretary, to Tokyo, where he learned Japanese. He later became Deputy Private Secretary to the Prince of Wales, and in 1990 was appointed Ambassador to South Korea. From 1996 to 1999 he was appointed Ambassador to Japan, and then became Chief Executive of British Trade International. He retired from the Diplomatic Service in 2002 and is still as busy as ever today with many business interests. He was made a Lieutenant of the Royal Victorian Order, LVO in 1990, a Companion of the Order of St Michael and St George, CMG in 1992, a Knight Commander of the Order of St Michael and St George, KCMG in 1996, and later a GCMG, Knight of the Grand Cross of the Order of St Michael and St George. 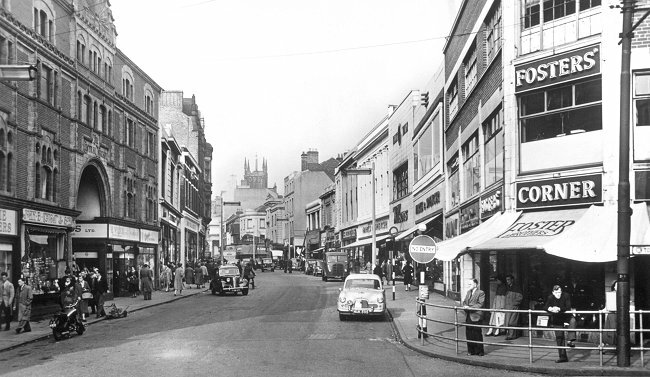 Dudley Street in the 1960s. From an old postcard. 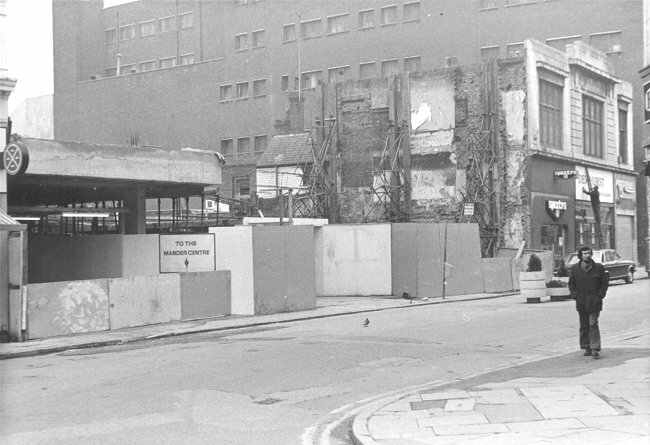 By the mid 1960s some of the shops were looking a little run-down and might not have been doing that well. The future however seemed bright. 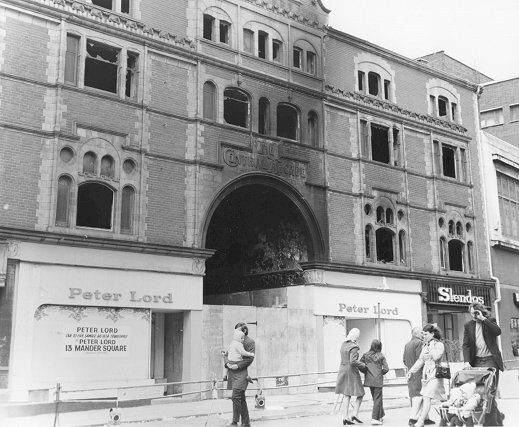 Unlike the Queen's Arcade, which was hastily demolished to make way for the Mander Centre, the Central arcade was to be retained as one of the entrances to the new shopping complex. This was partly the result of a successful campaign to keep the arcade. Unfortunately its long-term future was not to be. 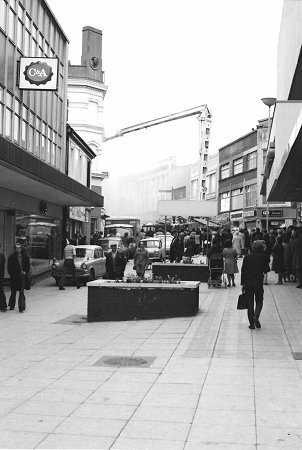 The Mander Centre opened on 6th March, 1968, and restoration work on the arcade began. It was repainted in an orange colour scheme, and became a busy thoroughfare as people passed through, on their way to, or from the Mander Centre. 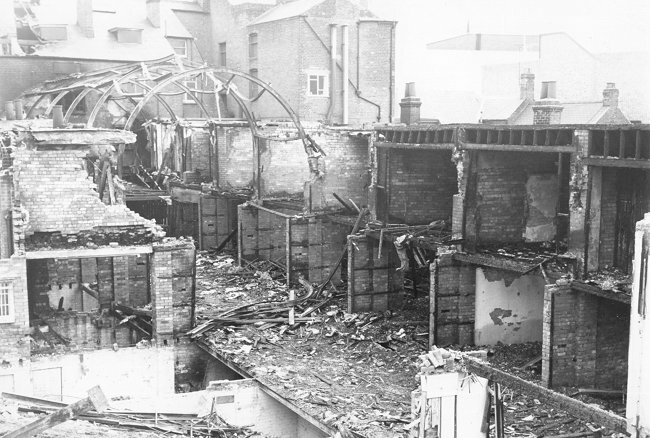 Sadly, shortly after the completion of the work, a disastrous fire rapidly turned the arcade into a pile of rubble. 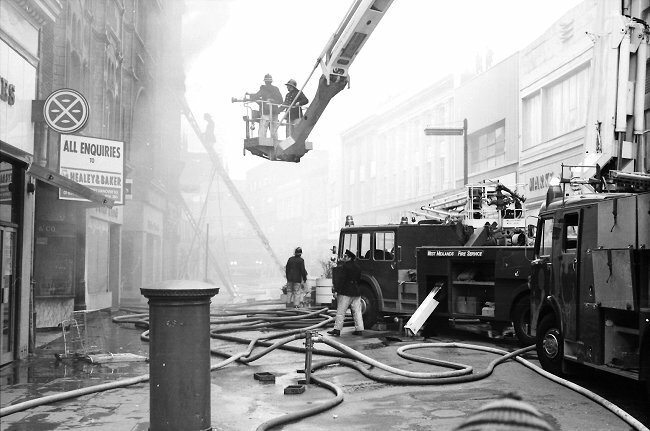 The fire, which took place on 20th May, 1974 was so fierce that little was left, other than the badly damaged frontage. 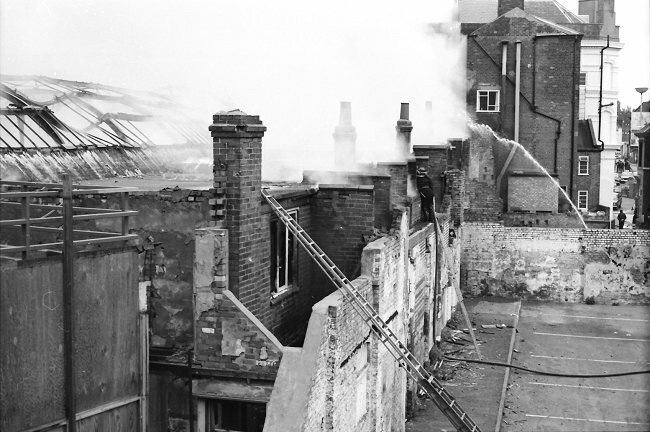 The rapid destruction may have been caused by a chimney effect, when air rapidly flowed through the long corridor, to feed the fire. The remains were declared unsafe, and quickly demolished. 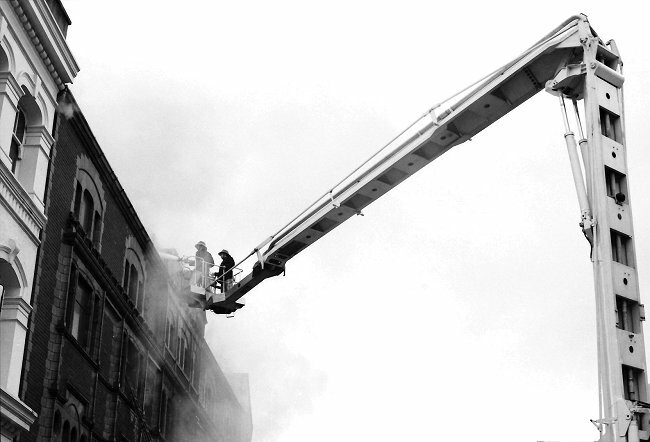 Firemen, hard at work in Dudley Street. Courtesy of Steve Jeffs. 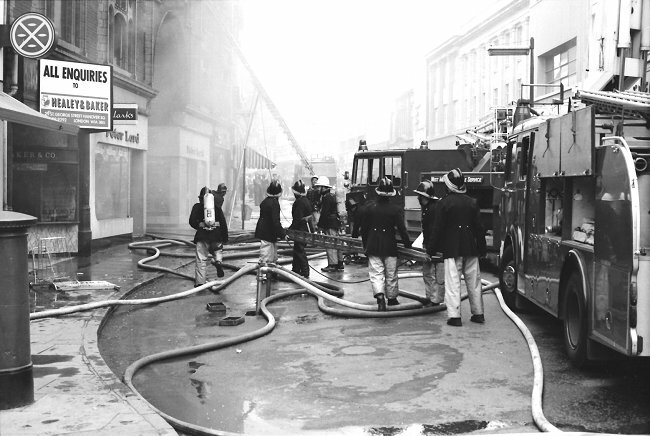 The fire rapidly damages the structure. Courtesy of Steve Jeffs. Fighting the fire from above. Courtesy of Steve Jeffs. 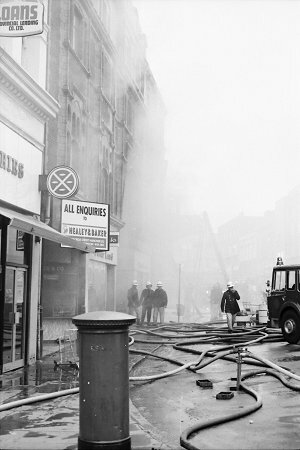 Fire crews in Dudley Street. Courtesy of Steve Jeffs. Tackling the blaze. Courtesy of Steve Jeffs. 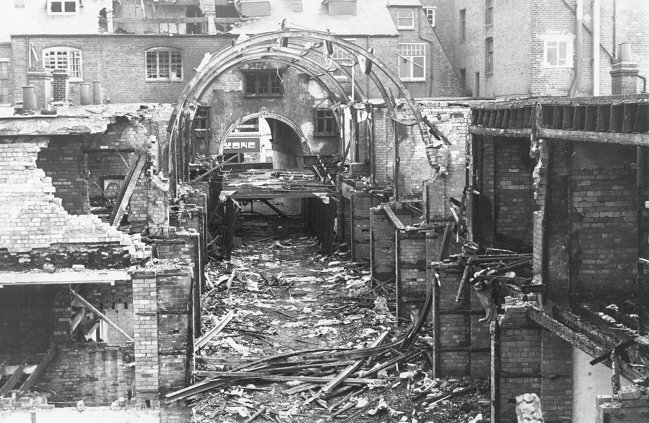 The arcade is quickly turned into rubble. Courtesy of Steve Jeffs. The fire comes under control. Courtesy of Steve Jeffs. The day after the fire. 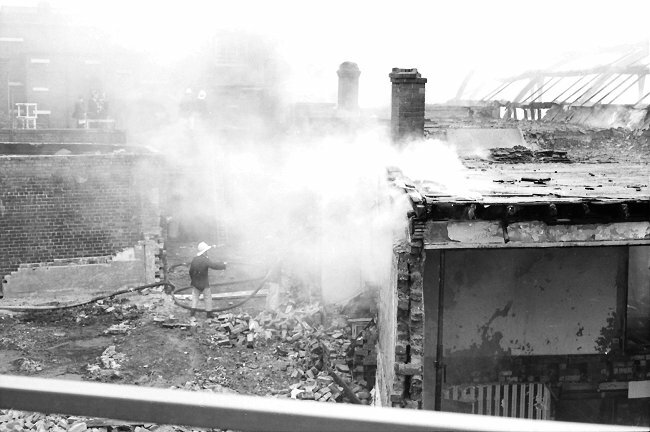 All that remained after the fire. Another view of the ruined arcade. Scaffolding is erected, and the site is cleared. Courtesy of David Clare. 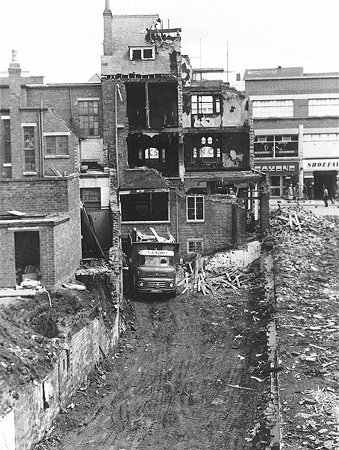 The site after demolition. Courtesy of David Clare. suggestion was that a tramp, who had been sleeping there, might have lit a fire to keep warm. 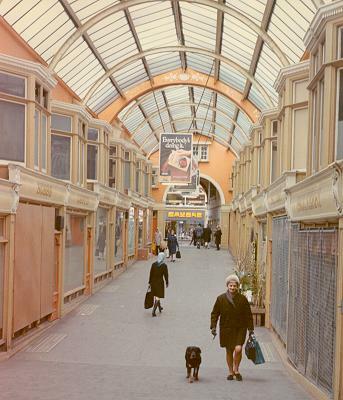 Whatever the reason, Wolverhampton lost one of its fine Victorian structures, its first and last traditional arcade.